A new flavor in the Sam’s Yams line of treats, these crunchy “cookies” combine the delicious flavor of fresh carrots with natural sweet potatoes and applesauce to make for a treat that’s your canine companions are sure to love. 7 oz. (198g) box of treats is $6.99. From Beth Sopko of New York, New York on 11/13/2009 . 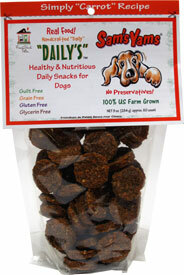 I love Sam's Yams products; these are excellent and my dog jumps out of his skin when I take them out. I just feel good giving them to him, and I wish the animal-supply store near me—which has other Sam's Yams products—carried these and the Calmly Chamomile treats.